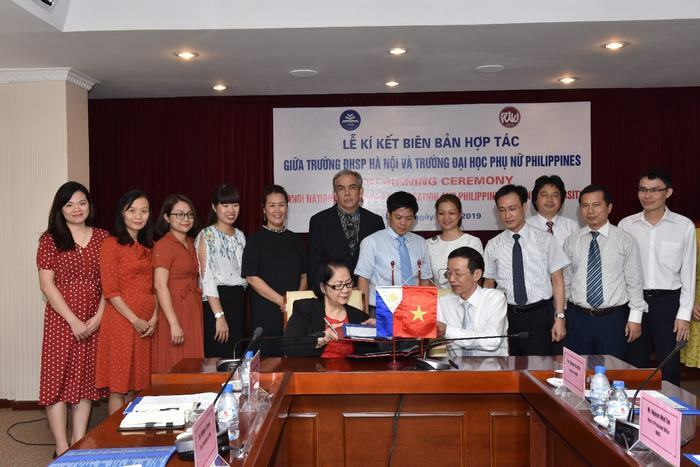 On September 4th, 2018, Hanoi National University of Education signed Memorandum of Understanding (MOU) with Philippine Women’s University. 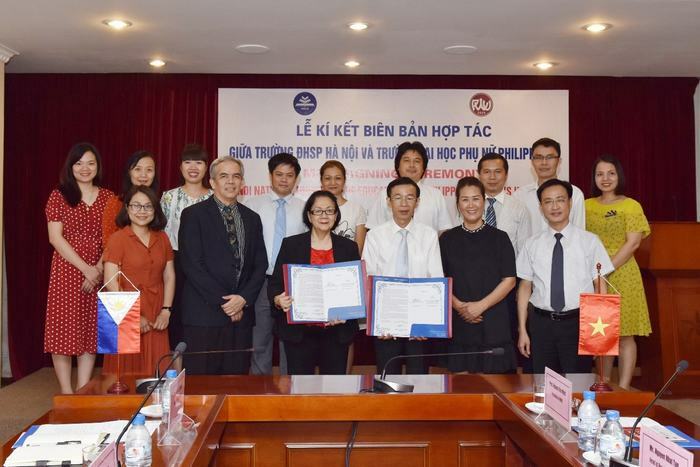 Attending the signing ceremony, on behalf of Hanoi National University of Education (HNUE), there was Prof. Dr. Nguyen Van Minh – the president of HNUE, M.A Nguyen Nhat Tan – Head of President’s Office, Assoc. Prof. Dr. Nguyen Thuy Nga – Deputy Head of President’s Office, Assoc. Prof. Dr. Dang Ngoc Quang – Head of Postgraduate Affairs, Dr. Nguyen Hiep Thuong – Dean of Faculty of Social Work, Dr. Nguyen Duy Nhien and Assoc. Prof. Dr. Nguyen Thanh Binh – Vice Deans of Faculty of Social Work, academic staff and students from Faculty of Social Work. Meanwhile, the representatives of Philippine Women’s University (PWU) were Dr. Felina C. Young and Dr. Alfredo B. Reyes – Vice President of PWU. The witness for the signing ceremony was Assoc. Prof. Dr. Nguyen Thi Thuan – Vice President of Vietnam Association of Social Workers. In the future, Hanoi National University of Education and Philippine Woman’s University are about to cooperatively study the direction of developing high quality associate degree programs at the bachelor and master levels, and promote the exchange of academic staff and students. These programs will initially be implemented at Faculty of Social Work and then expanded at other faculties depending on the actual needs and capacities of both the universities.